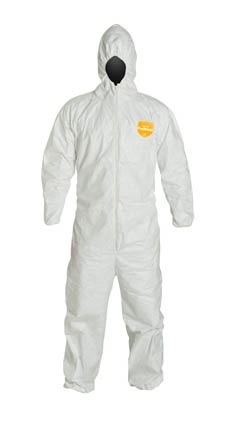 DuPont™ ProShield® Coverall. Comfort Fit Design. Respirator Fit Hood. Elastic Wrists and Ankles. Elastic Waist. Serged Seams. White. ProShield® garments have been optimized for comfort, softness and breathability. DuPont™ ProShield® disposable garments are designed for workers in a range of industries for nonhazardous dry particle and light liquid splash applications. Applications include: general maintenance and hospital visitation. 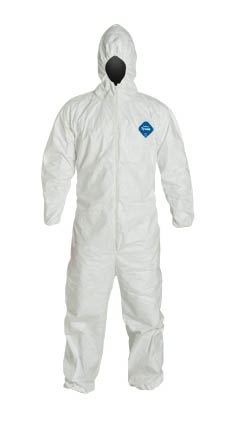 DuPont™ Tyvek® Coverall. Comfort Fit Design. Respirator Fit Hood. Elastic Wrists and Ankles. Elastic Waist. Serged Seams. White. 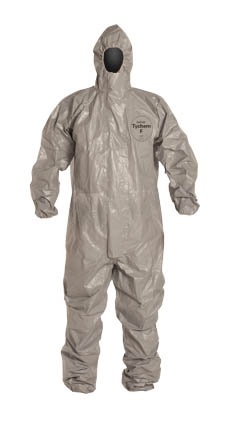 DuPont™ Tychem® C Coverall. Standard Fit Hood. Elastic Wrists and Ankles. Serged Seams. Yellow. 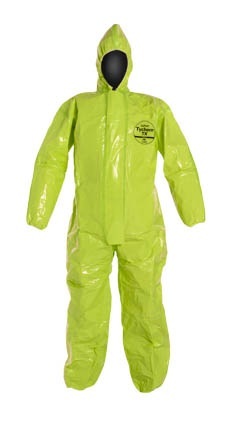 DuPont™ Tychem® F Coverall. Respirator Fit Hood. Elastic Wrists and Ankles. Storm Flap. Taped Seams. Gray. Tychem® F garments are strong, durable and lightweight and are available in low-visibility gray fabric making them a preferred choice for law enforcement, emergency medical services (EMS) technicians and military personnel. DuPont™ Tychem® TK Coverall. Respirator Fit Hood. Elastic Wrists and Ankles. Double Storm Flap with Adhesive Closure. Taped Seams. Lime Yellow. Tychem® TK exhibits excellent chemical barrier properties and offers an extremely durable fabric that is puncture- and tear-resistant. Tychem® TK fabric shows at least 30 minutes of barrier protection to 322 challenge chemicals with no observed breakthrough. Tychem® TK is specifically developed for protection against toxic, corrosive gases, liquids and solid chemicals. This high-performance chemical barrier fabric is suited for industrial, HazMat, and domestic preparedness applications. 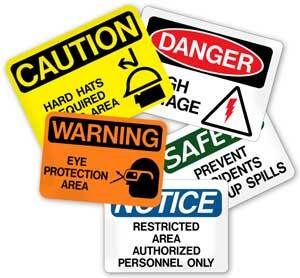 May also be suitable for use in Level B applications (according to US Environmental Protection Agency (EPA) & NFPA guidelines). 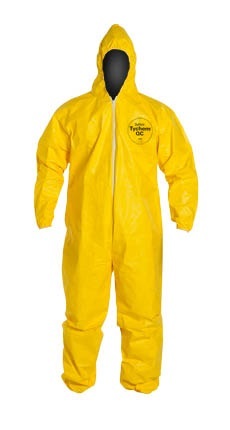 Tychem TK standard Level A Suit. Fully encapsulated front entry vapor protective suit, expanded back, sealed seam on outside only. 48" gas tight zipper, double storm flap with velcro, 40 mil PVC faceshield, butyl gloves, 2 exhaust valves, attached sock boots with boot flaps, 1.5" waist belt with 3 belt loops sewn (inside) and sealed. Storage bag included.